A special Thank you to Atria Publishing and NetGalley for sending me this book to review. I read a lot of YA fiction. I like YA fiction. I don't like gruesome murder or "adult" scenes. But every so often I want to read something less... juvenille, less wistful, more intense. I recently picked up The Book of Lost fragrances not having clear cut expectations from it. I hadn't heard of this author and I'm not a huge follower of mystery and crime novels. But I do LOVE travel factoid mysteries, like Angels & Demons and The DaVinci Code. (I've read everything by Dan Brown, actually. Love the history/mystery. The Plot lines are predictably formulaic.) Anyhoo... The summary of this book was definitely intriguing enough to catch my attention. I decided to give it a whirl, because hey, I could have just put it down if I'd hated it, right? Right. It is safe to assume that I really, really had a hard time to put this book down. There is so much more to it than the enticing summary lets on. Ancient Egyptian mysteries, Crime in modern Paris. Jet setting from New York. A bit of the supernatural/reincarnation. Great research. Catacombs. Kidnappings. Tibet and China. The Dalai Lama! Wow. Just wow. It was all tied together in a beautifully coherent, infinitely visual storyline involving characters that matter. 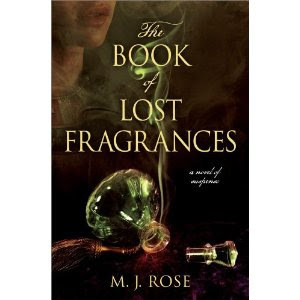 For a great frolic through time and across continents pick up The Book of Lost Fragrances!